I never thought I wanted a leather sofa for it didn't fit with Linderhof's decor. A well worn leather chair, yes, but not a sofa. Especially a new sofa. But husband Jim insisted and home it came. I love it -- it's a great place for an afternoon nap (if I can beat husband Jim to it) and I must admit that it is easy care. I hate to admit it, but Husband Jim was right. The leather sofa is perfect for Linderhof. 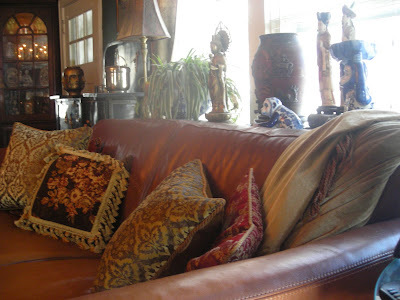 Love the leather sofa, it's not just any leather sofa. Leave it to you to place the perfect thing in the room! You have a knack. I know your husband suggested it - but you must be the one who put the pillows on it!